Gilford’s Rowe House, a c. 1838 Greek Revival Cape constructed of bricks made on site, has attracted much community interest over the years. Pavement now encircles the vintage farmhouse in an island-like setting among the school buildings located on land that once was the Benjamin Rowe Farm. Popular vote at a Gilford Town Meeting in the late 1980s spared the building from demolition, a fate destined for the barn and milk room that were then part of the farmhouse’s connective ar chitecture. Community support in the form of $40,000 in donations coupled with countless volunteer hours enabled the farmhouse to be restored to its 1800s appearance. But considerable concern has been expressed over the years that such a lovely old house deserves gardens that provide an historically appropriate setting. At long last the gardens at Rowe House are going to receive the attention that they need! This impetus was started by Gerald Knight who was often seen down on his knees in the Rowe House gardens this past summer pulling weeds. Soon Gerald was joined in the weeding process by his wife Doreen. Now it so happens that Doreen Knight, an avid gardener in her own right, is a member of the Opechee Garden Club. In the autumn, Doreen brought up the topic of the Rowe House Gardens at an Opechee Gardens Club meeting. The topic peeked the interest of Carmel Lancia, who has earned recognition as a master gardener, recognition that is also shared by Marge Muehlke, of the Muehlke Family Tree Farm. During the winter, Thompson-Ames Historical Society established a Rowe House Gardens Committee, which, under the leadership of Carmel and Marge, has attracted a noteworthy following of area gardeners. 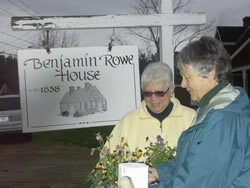 By early spring the Rowe House Gardens ideas were ready to be shared with the town and the school. School Superintendent Paul DeMinico supported the concepts, which in part envision an herb garden opportunity for school students. The onset of warmer spring temperatures has further enhanced the enthusiasm for the Rowe House Gardens project. Soil testing kits, shovels and roto-tillers are all poised ready for the signal to dig into the soil that is now being warmed by long-awaited spring. To help fund the Rowe House Gardens projects, the Rowe House Gardens Committee has planned a Plant and Bake Sale to be held at the Rowe House from 9:30 a.m. until 3:00 p.m. on Saturday, May 21st , with Sunday, May 22nd as the rain date. Gardeners and cooks are being asked to provide the items that will be for sale that day. This is the time of year when gardeners take a close look at their gardens and discover that the perennial plants have outgrown their space and need to be divided. If you are a gardener making such a discovery, please share the fruits of your labor with the Rowe House Gardens Committee so that some of your plants can find their way to the Plant and Bake Sale while others of your plants can be put aside to enhance the Rowe House Gardens themselves. Those of you who enjoy baking are asked to bake something that can be sold during the day of the Plant and Bake Sale. To help the Rowe House Gardens Committee plan for this important fund raiser, please telephone Thompson-Ames Historical Society at 527-9009 and leave your name, telephone number and a short message; you will receive a return call. Or, speak directly with Carmel at 293-2877 or Marge at the Muehlke Family Tree Farm, 524-9507, to let them know how you feel you can help. This is a wonderful opportunity for people who treasure the c. 1838 Rowe House to get involved in helping create an appropriate garden setting that can be enjoyed as part of the tours that are made available to the public by Thompson-Ames Historical Society. Remember also to keep up to date with the latest goings on at Gilford’s historical society by logging on to www.gilfordhistoricalsociety.org.